First of all, I had an excellent time meeting some of you last night at the Recessionista party. I had some of the sweetest conversations. Thank you. I wanted to take you all home in my pocket……but I settled from some really excellent Recessionista loot. Wow…..such beautiful things. Anyway, this is the final project of the scarf re-purposing series. (Part I, Part II, and Part III) And I have finally used up my stash. Perfect. 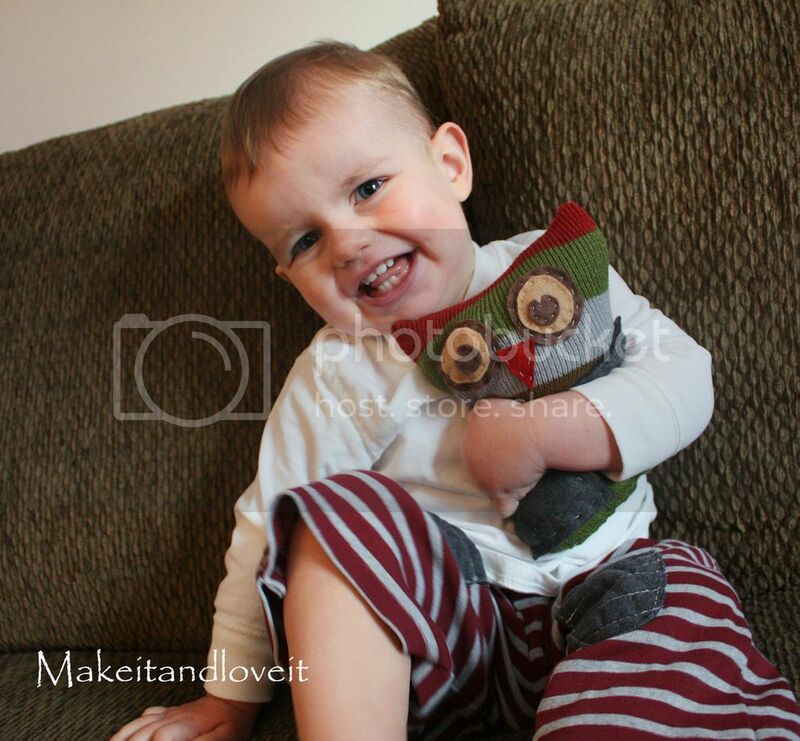 This Wise ‘Ol Owl is made using the leftover scarf from this project. And he just happens to be my little guy’s new buddy. Then sew along edges with right sides together, leaving the bottom section open. And then sew closed using a hand-stitch method from here. And that’s it……a cuddly new friend for anyone to enjoy. « Another new SPONSOR and GIVEAWAY!! I love this little guy! I'm going to have to make one, thanks for the great tutorial! love it. 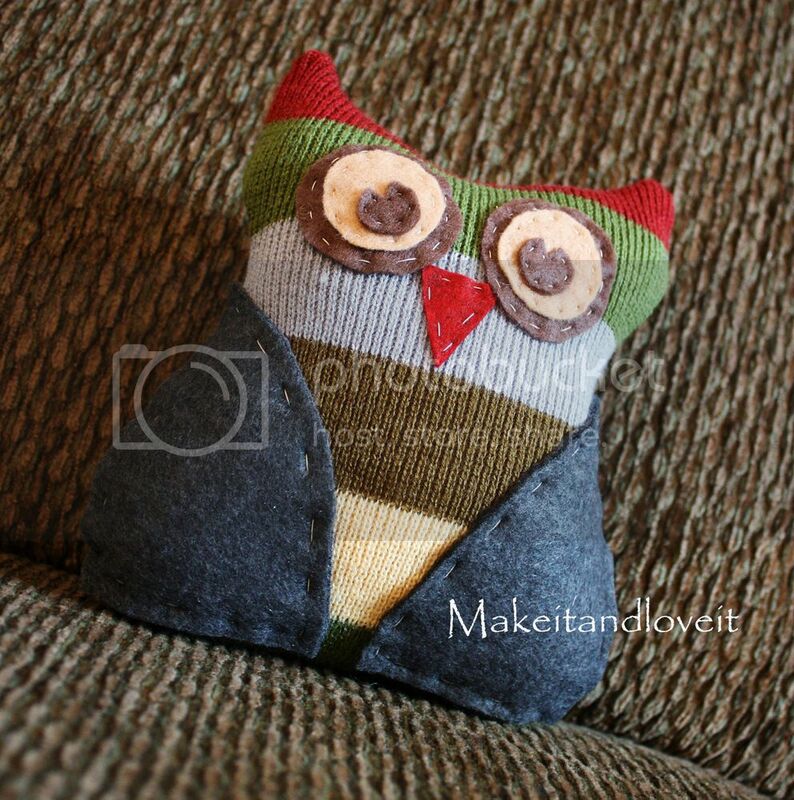 i made an owl recently like that only i never thought to use a recycled sweater, that looks so great! thanks for the tip. I love it! Thanks for the tutorial! This is great. I love owls. so glad to find this blog. What great projects. Thanks for going public. This is so darling! I can't wait to make one! OMG!! I love him!! I have a serious obsession with owls and I think I'm going to have to go out tomorrow to get some fabric to make this lil guy!! Love it and thanks for the tutorial! I was wondering if you had an easy Idea for making Stockings:)? It would be truly impossible for me not to feature this!!! Thanks so much Ashley! He is OWL so' CUTE! love him, and your little guy too! That is just too stinking cute!! Thanks for the TuT! Aww, he is so cute! And I love how easy-yay! Thanks so much, I'll be linking to this little guy. Any baby would love that! THank you for sharing the idea…I may make it for my little one! Mcgary's……I'll have to think up an easy tutorial for stockings. They definitely are pretty simple to make. I'll try and squeeze that in before we leave. Thanks so much for this fun idea and great tutorial! I was able to make all 5 kids a little owl for about $7!! Gotta love it!! Thanks for the inspiration. I'll be posting my little owls on tuesday and of course I'll be passing credit your way. Thanks again! Really lovely idea as always! this is so stinkin' cute! What a great idea! I was wondering if you used wool felt or if it's the "regular" kind. How did it wear after a while? I could use fleece for the wings etc if I don't have felt, right? This looks easy enough! I’m making over my playroom – trees, owls, birds, etc. This is perfect!